There's a secret step between 'announcement' and 'release' for action figures - 'factory figures hitting eBay'. 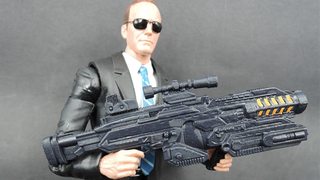 It's always a sign that new toys will soon be on the way, and often our best look at something before it hit shelves - and today we're treated to a trio of MCU SHIELD agents: Coulson, Hill and Fury, oh my! I love that he has an alternate head just for sunglasses. Phil needs his Shades! I wonder if this means that in the future we could get figures for the rest of the TV show's cast. Melinda May with kung fu grip? Fitzsimmons twin pack? Yes please. Alas, Maria doesn't look like she's turned out quite so well - I know Cobie Smulders has got a prominent jawline, but this figure looks bizarre. Her jawbone is almost as wide as her collar! That's bloody petrifying. This three-pack of SHIELD agents will be exclusive to Toys R Us in the US, for around $50. Never has a 'man in suit' action figure been so exciting.